After packing up our gear, we went downstairs to the dining room in the hostel, where a number of German cyclists were breakfasting. They had come as a group from Bavaria, and had their own special club van and trailer. I realized that this was the chance to get rid of our CO2 cartridges since we could not take them on our flights out of Europe and they were delighted to get them. I only hoped that the cartridges would work better for them than they had for Zeezu on the Stelvio! The plan was to meet the bus around 2 pm at the terminal and head back to Rosenheim, so we had the whole morning available to us to wander around Bolzano and look at whatever we had not had a chance to before. Unfortunately, it was the actual Ferrogusto holiday, so everything was pretty much closed except, of course, for the numerous churches, which seemed to be doing a good business. Janice and I decided we would take a walk together through the old city and I had the chance to photograph some of the interesting old buildings. We found a ver old church and administrative complex that was the local headquarters of the Teutonic Order. I wrote a paper on the Order during a year of independent study at university and in my travels in Europe I have occasionally come across evidence of the organization, which remains headquartered in Vienna. We walked past the arcaded passage of the Lauben, the old shopping street, soon reached our goal for the morning, the Museo Archeologico dell’Alto Aldige. It did not open until 10 a.m., so we still had a bit of time. We had been warned that it was one of the most popular attractions in the region and to expect a big crowd but there were only a few people waiting on the steps. We went across the street to one of the few open cafés we had seen. Unusually, this one was run by a young Chinese couple but, as usual, we had excellent coffees and some fine pastry. And the chance to hear Italian spoken with a Chinese accent. Just before 10:00 we crossed the street again. It was hot and sunny as we stood in line, which had lengthened to around 20 people. The doors opened and we snaked our way up to the ticket counter quite efficiently. There was a checkroom handily located so I put my little backpack and camera there and then we paid our 9 Euros each and were in. The Museo Archeological is in a fine old building but the interior is quite modern as, to a large extent, the museum came into being to house the forensic findings resulting from the 1991 discovery of the frozen remains of a Neolithic man high in the Alps above the Ötz Valley. When it was discovered that they were 95 metres inside Italian territory, the body and all the related artifacts were moved to Bozen and eventually ended up in the Sudtirol Archaeological Museum. This was a major discovery as not much as known about the people living in this area 53 centuries (!) ago. Fascinating scientific research has provided a great deal of interesting information about the Iceman, his clothing, food, equipment and even speculation on how he died all those years ago. The displays were exceptionally well done as we were taken through the details of the discovery in a multi-media presentation. The mummy itself is kept in a special refrigerated and pressurized chamber with a small window, and there are showcases around with details of the objects found around Mr. Ötzi, some of which, including his hat, were discovered on subsequent trips to the spot by scientists. Of course, everyone loves a mystery and over the years the forensic examinations have shown that Ötzi, who was of an advanced age for the period (being all of 46 years old) was the victim of an act of violence and probably died on the ridgetop from his wounds rather than from exposure. He might have been part of a raiding party into the valley that went wrong but in any event the story is a fascinating one and the Italians are to be commended for their very fine museum. In addition to an audio guide, the signage in the building was all in Italian, German and English so it was easy to follow the story. Although probably the most celebrated mummy in Europe, Ötzi is not alone. We were fortunate to be in Bolzano at the same time as a special exhibition in the museum: “Mummies: The Dream of Everlasting Life.” In fact, this exhibition took up 2 ½ floors of the museum and included specimens from Egypt, which of course resulted from a complex man-made process. Mummification, usually by natural processes, occurred in salt mines or other dry environments. In some cases, it was caused by insects (there were some small animals on display that had been so attacked) or, as in the case of the famous Peat People of Denmark, by falling into a bog. Actually, the Peat People also show marks of violence and may have been part of a sacrifice ritual. If the museum has whetted your appetite for the Neolithic world, you can also visit the Schnalstal archeoParc (www.archeoparc.it), which is located not far from the place where Ötzi was found. 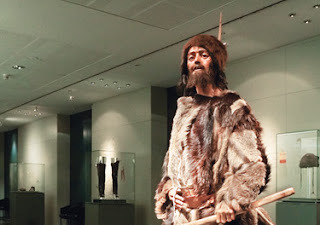 This is an interactive museum located 1500 m above sea level and offers reconstructions of the objects found with the Iceman as well as a reconstruction of an entire village of the Late Neolithic Period. Every day you can do Neolithic things there, such as bake bread in domed ovens, smelt copper ore and practice your archery. Different from Disney World for sure, but I am sorry that we did not have the opportunity to visit the park, with its surrounding spectacular scenery, but I will save this for another trip when I have a car to get me there. After spending nearly two hours in the museum, we headed back into the heat and sunshine and continued our promenade in Olde Bolzano. Janice headed back to the hostel while I took a few more pictures. I had seen a sign for a small café hidden away in a courtyard and I went there for lunch. It was wonderful to sit quietly outside in the sunshine and drink an excellent Först beer while waiting for my food. I had bought an Italian cycling magazine to read at the train station and I enjoyed going through this, feeling in the total holiday mood. My enormous pizza Margherita came and I had to photograph it as a souvenir of another superb day. Returning to the hostel, stopping for yet another ice cream on the way back, I joined the others and we walked our bikes over to the terminal. Unfortunately, there was no sign of the bus and we ended up waiting in the garage for quite a while. I suspected that there were holiday traffic issues. It turned out that the bus company had sent me an e-mail to let me know the bus would be late but it had not occurred to me to go on-line at the hostel, regrettably. We called from the garage and learned that Ricci and the bus would be picking us up closer to 5 pm. He arrived at the new time and we quickly got loaded up and on board. I was worried it would be a long drive back but the traffic was very light as we headed north. Once again, we passed through incredibly beautiful scenery heading out of Italy and into Austria, but the show ended in three hours as we pulled back into the Rosenheim train station parking lot. Past masters at this, we organized a van taxi to take our luggage back to the hotel and we all cycled back the short distance to the hotel. Working quickly, everyone rapidly packed their bikes in their cases and we had one more celebratory dinner at our chic outdoor café across the street. The next morning everyone went their own way. I took a cab to the station in the morning and had a comfortable train ride back to Munich, where I caught a flight on budget Air-Berlin northwards, arriving in Berlin for the last, non-cycling, part of my vacation. Better than "Cash for Clunkers"